The focus of this class will be on creating wonderful, subtle color using dyes from only the plant world to pattern fabric that has been shaped and bound before dyeing. By stitching, pleating or wrapping, and then binding before dyeing, exquisite patterns emerge that are visual and textural memories of the shaping process. For this workshop we will use a natural indigo vat process for blues. Indigo has a rich and mysterious history in the world of textiles. It imparts a blue to cloth that has inspired people around the world for thousands of years. We will concentrate on preparing shibori using cottons and linens for our work in the indigo vat. Several different plant dye extracts (all inter-mixable) will also be used to dye silk and wool along with our cotton, linen, and hemp. These include madder, a root used for red, peach, and rust shades. From osage and fustic we’ll derive yellow and ochre hues, and cutch, a wood source, will give us rich browns. Experiments with cochineal will produce fantastic magentas, pinks, and reds. As time permits, we’ll use cochineal extracts along with a dye bath of genuine dried cochineal bugs. Students will learn safe ways of handling dyes and mordants *. Using only Alum as our mordant, we’ll shift color with iron sulfate and vinegar. The instructor’s extensive collection of shaped-resist dyed textiles from around the world will be used as a resource. Plant dye extracts are viewed as a sustainable way of plant-dyeing, and are convenient and safe to use. They produce a wide range of deep and subtle color, and they work brilliantly with Shibori. *mordants are metallic salts which allow the dyes to attach to the fiber “permanently”. 3-5 yards (total) of white or off-white pre-washed 100% linen, hemp, ramie and/or rayon fabric. Some of each is good, for a total of 3-5 yards. Pre-wash, hang to dry, do not iron. Please note that cotton works the LEAST well of the cellulose fibers for plant-extract dyeing. Some cottons do well with natural dyes, but you will be better off with linen, hemp, ramie, and/or rayon. Note: Silk-rayon velvet works wonderfully; the fabric you select should not be difficult to sew through by hand. 3-5 yards of white or off-white silk and wool; some of each is good for a total of 3-5 yards. Pre-wash, hang to dry, do not iron. The fabric you select should not be difficult to sew through by hand. *Note: All items marked with an asterisk will be available in the Shakerag store. Joan Morris began making shibori in 1983, the same year that marked her beginning to work as master-dyer for the theatre department at Dartmouth College, where she continues to work. She has dyed the textiles for over 60 productions there. Joan began teaching shibori in 1989. She teaches shibori internationally to adults, as well as to children in the schools of the northeastern United States. In 1997 she designed the textiles for a scene in Julie Taymor’s “The Lion King”. Since then she has fabricated the textiles for its international and road productions. She has been working on the creation of a merger of painting, printing, erasing, gilding, and shaped resist dyeing for the past 12 years. 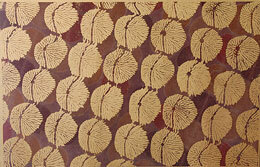 Her shibori textiles have been exhibited nationally and internationally.